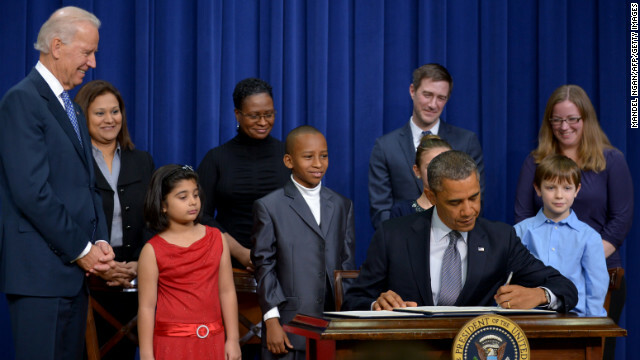 President Obama signs gun-violence-related executive actions following an announcement at the White House Wedensday. Below are the latest updates as they come to us. Also, you can read our full story, and check out details of Obama's plan. protecting America's most valuable asset - our children. "Attacking firearms and ignoring children is not a solution to the crisis we face as a nation. Only honest, law-abiding gun owners will be affected and our children will remain vulnerable to the inevitability of more tragedy." [Updated at 12:43 p.m. ET] Senate Democratic leadership sources tell CNN that passing any new legislation will be extremely difficult because more than a dozen vulnerable Democrats from conservative states will probably resist much of what the president is pushing, according to CNN's Dana Bash. These Democratic sources say the most likely legislation to pass will be strengthening background checks, since it is the least overt form of gun control and it also appeals to gun rights advocates' emphasis on keeping guns away from people with mental health and criminal problems. "In the hours after the worst of our fears were confirmed, in the midst of the grief and sorrow over the loss of 20 innocent children and six dedicated educators at Sandy Hook Elementary School, there was one question on the minds of people across Connecticut and around the nation: How do we make sure this never happens again? Today the president took the critical first step toward answering that question. The common sense measures he proposed today are something that we should all be able to agree on, and I want to commend him and the vice president for their work on this issue." "House committees of jurisdiction will review these recommendations. And if the Senate passes a bill, we will also take a look at that." [Updated at 12:17 p.m. ET] Obama says he acknowledges that Americans have certain unalienable rights, but with those rights come responsibilities, and that Americans are "responsible for each other." These rights - including those to life, liberty and the pursuit of happiness - were denied to victims of high profile shooting such as those at Virginia Tech last decade and the December 14 shooting in Newtown, Connecticut. Obama called for public pressure on Congress and the gun lobby to push for stronger steps against gun violence, saying "the only way we can change is if the American people demand it." "Let's do the right thing ... for (shooting victims) and for the country that we love so much. Thank you. I'm going to sign these orders," he said. [Updated at 12:10 p.m. ET] More details on what Obama said about the 23 executive actions he's poised to take: The actions, he said, include those that would strengthening background checks on gun sales and expand safety programs in schools. He hasn't said what all of the 23 actions would do. [Updated at 11:59 a.m. ET] President Obama has started to speak, and he's thanking Biden for his work to recommend gun-control steps in the past couple of weeks. The nation should be motivated to keep children such as these from harm, he said. "Their voices should compel us to change," and that's why he asked Biden to come up with recommendations that the country should execute "right now" to curb gun violence, Obama said. [Updated at 11:56 a.m. ET] "The world has changed and it is demanding action, it is in this context that the president" asked me to come up gun-control recommendations, Biden said. Some of the recommendations that Biden's task force gave to Obama on Monday include executive orders that the president can make without congressional approval, Biden said. [Updated at 11:53 a.m. ET] Vice President Joe Biden has begun the event with an acknowledgement of the December massacre at a Connecticut elementary school, where 20 children and six women were killed. "It's been 33 days since (the nation's heart) has been broken" by the Newtown shooting, he said. He's also addressing the Newtown victims' relatives who are attending the White House announcement. Obama and Vice President Joe Biden are expected to unveil - around 11:55 a.m. ET - gun control proposals that, according to a source, will include background checks on all gun sales, a ban on assault weapons, and a ban on gun magazines with a capacity of more than 10 rounds. This post will have details on Obama's proposals as they are announced. Check this page starting just before noon ET, and refresh often for updates. The police have weapons and we need the same weapons that the police have. The Supreme Court has ruled that the police are under no obligation to defend its citizens. We must be able to defend ourselves. When Katrina happened in New Orleans, most police bailed and or joined in the crime spree. This is why you need these types of rifles. They work great for hunting also but the main purpose is to defend against a rogue government. We have seen this happen in our own country from riots to weather issues. The police are not always there. CNN only reports Leftist liberal ranting. Never does it report objectively and has lost all credibility in my opinion. And I'm only a father of 2 and employer and taxpayer.Who grew up in poverty and has never taken a dime from any social programs..
Wow, wonderful blog format! How lengthy have you been running a blog for? you make running a blog glance easy. The overall look of your website is fantastic, let alone the content material! I am so torn on the subject, I can see both sides but I do think something needs to change.